During the 1880s waves of immigrants began to pour into Duluth and would continue doing so for the next thirty years. Some were recruited for specific skilled jobs, such as Norwegian and Swedish fisherman. Some were well-educated western Europeans—Protestant English, Scots, and Germans, mostly—and came to Duluth, as did Yankees from the eastern U.S., with letters of introduction to help establish them in their professions. But most of Duluth’s immigrants were unskilled laborers, escaping the problems of their home lands, from famine to poverty to political strife. During the 1880s Duluth saw mostly Scandinavian (Norwegian, Swedish, and Danish) immigrants, along with Irish, German, Austrian, and Canadians with a few French and Italians mixed in. Over seven hundred Russians had arrived by 1890. The 1890s saw more of these same groups arrive, along with a smattering of others: Belgian, Bohemian, Dutch, Hungarian, Spanish, Turkish, and even a few Asian immigrants. The French and Swedish populations increased while the Russian was cut in half. Beginning in 1896 Finns were recruited to build the concrete piers along the Duluth Ship Canal; by the turn of the century, they were here in large numbers. After 1900 the population of Italians, Germans, Turks, and Russians took a significant leap upward. The Russian population included a number of Orthodox Jews. Duluth had long included Jewish residents, but the majority of them were considered “German” Jews, those from Germany, or Hungarians and Bohemians who spoke German. Most lived on the East Hillside—close to their synagogue, Temple Emanuel—and practiced Reform Judaism. The Russians were Orthodox and lived further west on the Hillside, near Tifereth Israel, which was first located at Third Avenue East and Fifth Street. A group of Lithuanian Jews lived on St. Croix Avenue, between Buchanan Street and the ship canal. They relocated to the Hillside after building Adas Israel Congregation in 1899, just down the hill from Tifereth Israel. The area became known as “Little Jerusalem.” By 1900 Duluth had four synagogues; the Jewish population peaked in the 1930s at 4,000. 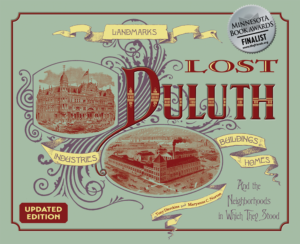 While many skilled and professional transplants to Duluth mostly found a place to live north and east of downtown, families of unskilled laborers settled in undeveloped areas, mostly found in the West End, close to the mills and docks where they would find work. The Finns took over “No Man’s Land,” the shanty town along Minnesota Point in today’s Canal Park Business District. Swedish-speaking Finns found a home on Grass Island near Rice’s Point and along Garfield Avenue; the community was referred to as Swede Town. The French first inhabited The Glenn below Point of Rocks, and after they moved deeper into the West End the Italians turned The Glenn into the lower half of Little Italy. A portion of today’s West End business district was once called Corktown because of its heavy Irish population. Many Poles, who farmed on their properties and raised geese, lived in a corner of the West End called Goosetown (many also lived on the Central Hillside). By 1910 Third Street in the West End had a French Catholic Church, a German Catholic Church, and a Polish Catholic Church all within the space of a few blocks. Despite this, the West End has been called “heavily Scandinavian,” as Norwegians and Swedes still dominated the landscape throughout Duluth. After the turn of the century immigrant populations began to level off or even decline. Outside of a jump in Austrians and Romanians (and a continued flow of Finns) in 1900, existing immigrant populations stabilized. 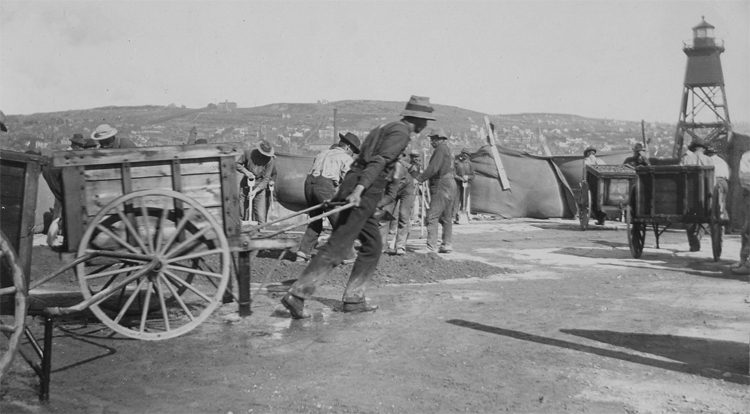 A wave of Serbs arrived in 1905 to build Thomson Dam, and another wave in 1913 to build U.S. Steel and Atlas Cement, where many of them would find steady work as unskilled laborers. But they could not live in Morgan Park, which was reserved for families of management, foremen, and skilled laborers. Instead, they lived in Gary and New Duluth in substandard housing.